Dr. Garcia is Director of Centro de Ortodoncia in Tijuana, Mexico and International Straight Wire and Orthopedics Seminars, Inc. in Waukesha, Wisconsin. He has been involved in teaching orthodontics and functional appliances since 1985 throughout Canada, United States, Chile, Mexico, Puerto Rico, Poland, Spain, Holland, Portugal, Germany and Australia. He received both dental and orthodontics degrees from the University of Latin America in Mexico City. George Brown College, Toronto, Ontario Canada – 1992, Dental Assisting Diploma —C.D.A. Monroe Community College, Rochester, NY – graduated 1997,Degree in applied Science in Dental Hygiene -R.D.H. Katharina will be conducting Dr.Garcia's auxiliary orthodontic program, keeping the auxiliaries in step with the new techniques being taught in the doctor's session. 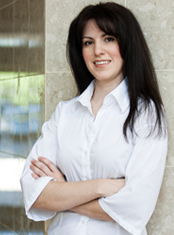 Katharina first took Dr. Garcia's course in 2004. Having 14 years of dental experience, Katharina is currently working in two busy progressive general practices in their orthodontic department, gaining hands on experience in orthodontic procedures and techniques.